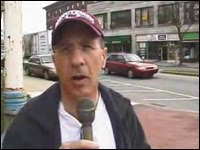 FRAMINGHAM — .In a statement on its Web site, the Anti-Defamation League says the host of a local cable TV show is an anti-Semite who promoted denial of the Holocaust in his program last week. Rizoli said his audience had been "brainwashed for the last 50 years on the propaganda ... that really isn't dealing with the subject matter straight on." Trestan said a viewer from Framingham called his group about the show. He said the ADL felt people who are familiar with Rizoli's immigration views should know there is another side to his beliefs. Jim and Joe Rizoli say that Brazilians have "raped" their hometown of Framingham, Mass., and turned it into a Third World "slave camp." They vilify immigrant women as sluts and prostitutes, and have so aggressively confronted suspected undocumented workers that the U.S. Department of Justice held a public hearing to calm the situation in 2006. They defend the "free speech" rights of jailed neo-Nazi Ernst Zundel and, just last year, Jim Rizoli said that Jews support illegal immigration because "Russian Jews invaded this country years ago and took advantage of all the free services they could get, and they got plenty." But they are not, the Rizolis insist, Holocaust deniers. Nothing, say the conspiracy-obsessed twins who founded Concerned Friends of Illegal Immigration Law Enforcement in 2004, could be further from the truth. There's much to suggest otherwise. The Intelligence Report has uncovered a series of Web postings that certainly seem to come from the Rizoli brothers, and they are unambiguous in nature. Archived Web pages from the early 2000s, before the Rizolis became public figures, contain a wealth of comments by persons using the same handles that the Rizolis still use today — "jjrizo" for Jim, "JoRiz" for Joe — and that also contain photos of each of the Rizolis. The comments include multiple claims that Jews were never murdered by poisonous gas during World War II, and that most of the atrocities of the Holocaust were grossly exaggerated or total hoaxes. "Burning bodies was to kill the diseases that would be spread by the dead bodies that were dropping like flies from sickness and disease, not gassings," read a Nov. 12, 2002 post attributed to Jim Rizoli. The posts claimed that no more than 1.1 million Jews died during the war. That's a small fraction of the death toll of 5 million to 6 million that is accepted by mainstream historians. Echoing another common Holocaust revisionist theme, the posts also attributed those deaths solely to typhus and other diseases that spread in "labor camps," not death camps. "Hitler wasn't stupid. He made sure he used the Jews and others for all the work they could perform in the factories," read another post by "jjrizo," this one dated Nov. 8, 2002. "I'm not saying there weren't any concentration camps because there were, because you had people that were criminals and had to be dealt with." Contacted by the Report concerning the Holocaust postings, Jim Rizoli said he was the victim of virtual identity theft. "Let me set you straight. My identity was stolen. People were posting things using my name." Asked his opinion of Holocaust denial, he said, "I have no interest in that. Nothing. I'm not going to get into that." Rizoli failed to explain why, if his online identity was indeed stolen, he and his brother continue to use the same cyberspace handles six years later. He also could not explain why anyone would seek to defame him or his brother, at a time when the two were not activists and were virtual unknowns in the community. Since he has achieved fame, of sorts, Rizoli has been the victim of a string of online pranks. According to an April 25 story in Framingham's Metro West Daily News, three fake craigslist ads featuring Jim Rizoli's phone number appeared in the "Men Seeking Men" section in December 2007, one of which was titled, "Looking for my donkey show." Another ad featured a photo of Jim Rizoli holding a microphone next to a photo of male genitalia alongside a ruler. Police investigators seized a computer owned by Framingham resident William Tulaba in connection with the fake ads. Tulaba is married to Ellie Tulaba, a U.S. citizen of Brazilian descent who's frequently harassed by CCFIILE members. On July 31, William Tulaba pleaded not guilty to one count of criminal harassment in connection with the case. But unlike the craigslist images, the photos of the Rizolis that appeared next to the Holocaust-denying posts appeared in online forums that the Rizoli brothers may well have had a special interest in. Most of the Holocaust denial material posted under the Rizolis' monikers appeared on jehovahs-witness.com, a website forum for ex-Jehovah's Witnesses. By their own account, the Rizolis, who are 56, were Jehovah's Witnesses from 1973 until they were both "disfellowshipped" in the 1990s for defying church authorities. Jehovah's Witness officials told the Report that they never publicly discuss the removal of a church member. If the Rizolis indeed went from ex-Jehovah's Witnesses to Holocaust deniers, their transition paralleled that of Ditlieb Felderer, a Swede who is arguably the world's most bizarre Holocaust denier. In their postings, "JoRiz" and "jjrizo" described Felderer as their inspiration. With his shoulder-length blond hair, oversized wire glasses and Day-Glo 1980s workout clothes, Felderer cuts an outlandish figure. He leads Holocaust revisionist tours in Poland. He wrote books and pamphlets claiming Anne Frank's diary was a hoax and that concentration camps were merely "labor camps" for "Jewish criminals." And he designed "satiric" flyers that encouraged readers to cut off hair or skin and send it to Holocaust museum directors under the label, "Pure Jewish Fat Scent: Hungarian Jews, Auschwitz gas chambers, 1940." Like the Rizolis , Felderer claims to have been disfellowshipped by the Jehovah's Witnesses. "[Felderer] not only got the JW's mad at him but as a result of trying to find truth in numbers got the Jews mad at him," "JoRiz" wrote in a post dated Oct. 29, 2001. "You can't win." By the 1980s, Felderer was publicly doubting the Holocaust took place at all and testifying in court that Jewish prisoners at Auschwitz enjoyed amenities such as swimming pools and concert halls. To back up their claims regarding the Holocaust, "JoRiz" and "jjrizo" linked to websites run by notorious Holocaust deniers David Irving and Ernst Zundel. They also linked to articles published by the Institute for Historical Review, a longtime Holocaust revisionist outfit based in California. Ernst Zundel, the neo-Nazi Holocaust denier expelled for immigration violations from both the United States and Canada, is apparently the one "illegal alien" the Rizoli brothers approve of. In 2004, the Rizolis, using their real names, both signed petitions in support of Zundel, publisher of tracts like The Hitler We Loved and Why, UFOs: Nazi Secret Weapon? and the infamous Did Six Million Really Die? Zundel, who at the time was facing imprisonment in Germany for promoting Holocaust denial, was an ironic choice of martyr for the Rizolis, who had just recently started raising a ruckus in Framingham about illegal immigration. That's because Zundel, a German citizen, had lived most of his life in Canada but fled to the United States when it looked like he would soon be sent back to Germany, where he had been convicted in absentia. But he overstayed his visa in the United States and was deported for immigration violations back to Canada, which soon ordered him sent to Germany. The Rizolis told a Massachusetts newspaper their support of Zundel was based purely on free speech issues. Throughout their Holocaust denial postings, "JoRiz" and "jjrizo" maintained that their challenges to established history were neither anti-Semitic nor anything less than wholly factual. "All those pictures of people thrown into pits looking like skeletons were most likely the ones who contracted typhus and died a horrible death. They also could be pictures of those who starved to death because the allies bombed all the supply lines coming into the main roads that supplied the camps," wrote "jjrizo" in a post dated Nov. 19, 2002. "A lot of those people could of walked out of those camps if they didn't die of typhus or starve." Forum members who disputed these claims were quickly branded as slanderers. "I'm disgusted that you can twist something like the killing of innocent people to make it look like I condone it," "jjrizo" wrote in the same post that described victims of Nazi murders as casualties of disease or the Allies. "You really have some issues in your life that you need some help with."